Here she is just last week. 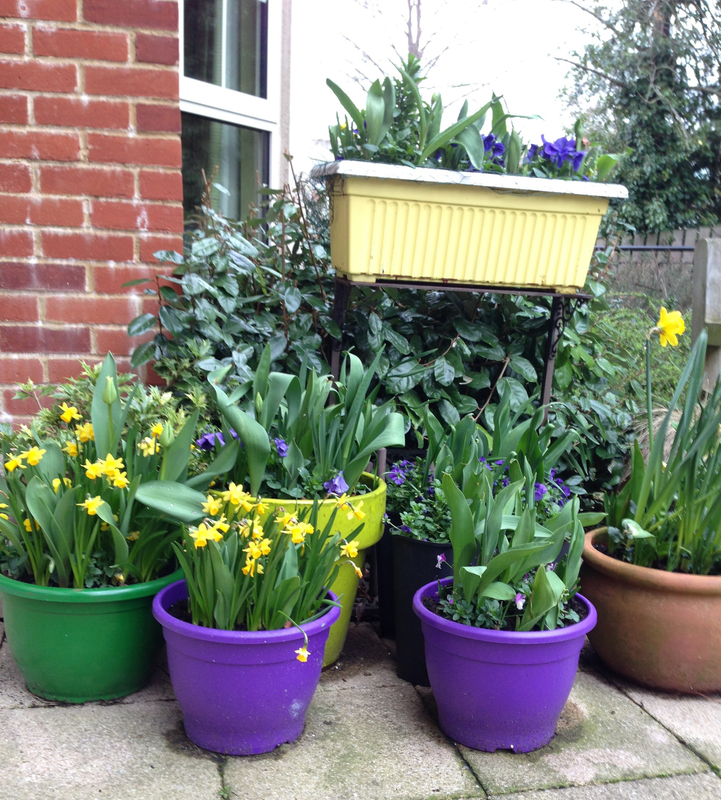 And here are the pots she planted last autumn, showing daffodils now and with tulips to come. There’s a moral there somewhere. And here is my front garden. Looks like we think the same way about colours. I’ve spent over 40 years running to get so far away and be different, it looks like I’ve been running in a great big circle and have ended up very near where I started. A moral there somewhere too. 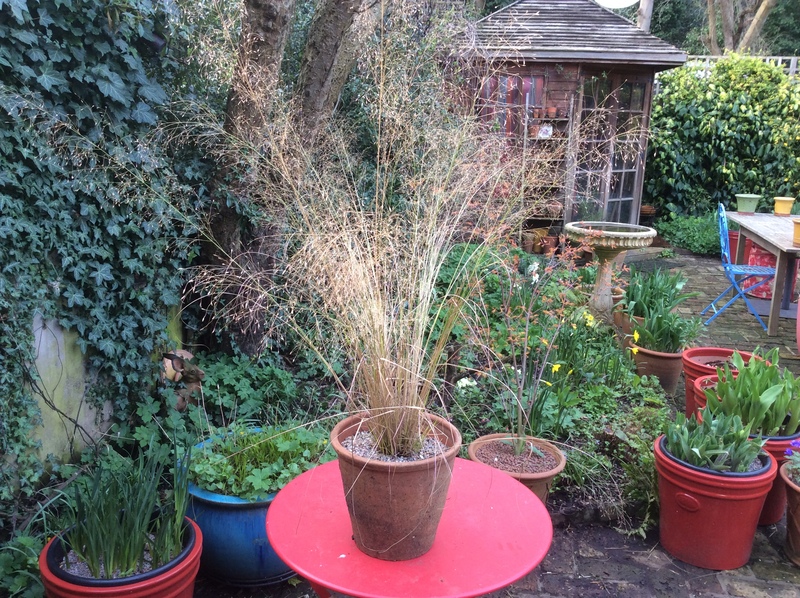 This is a grass I didn’t cut down over winter. This is another of the same type which I chopped down in November to see what the difference would be. 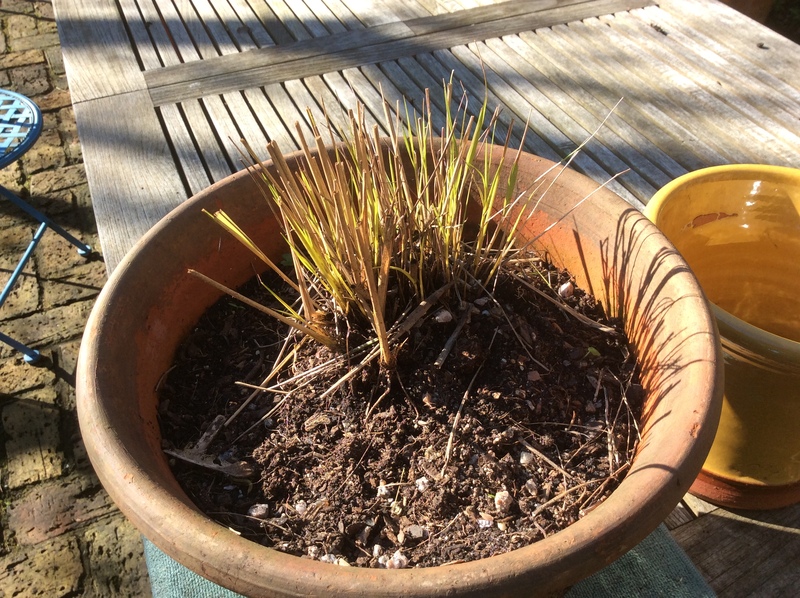 I was afraid I had killed it but suddenly I see new green shoots coming through the dried stalks of last year’s stems. I carefully pulled out the brown stems to leave the new ones room to thrive. It should look great by summer. 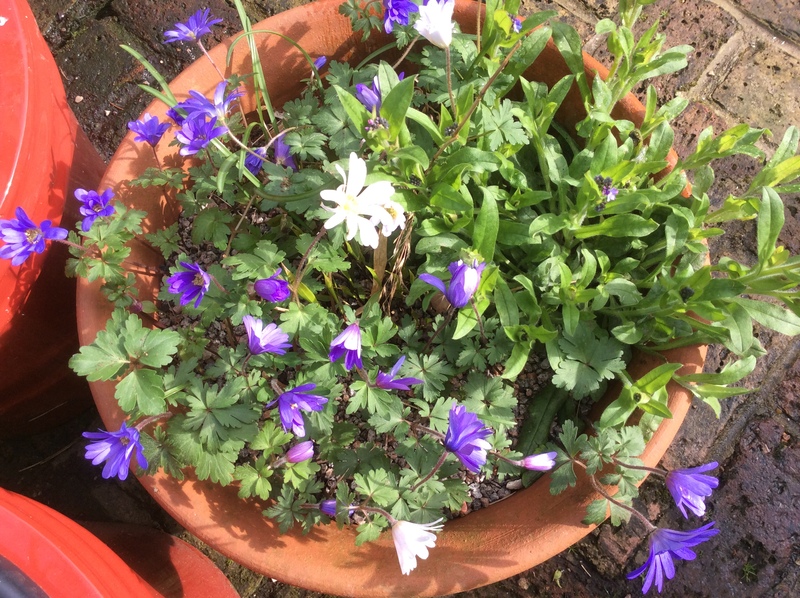 They are looking beautiful both in the borders and here in this pot. 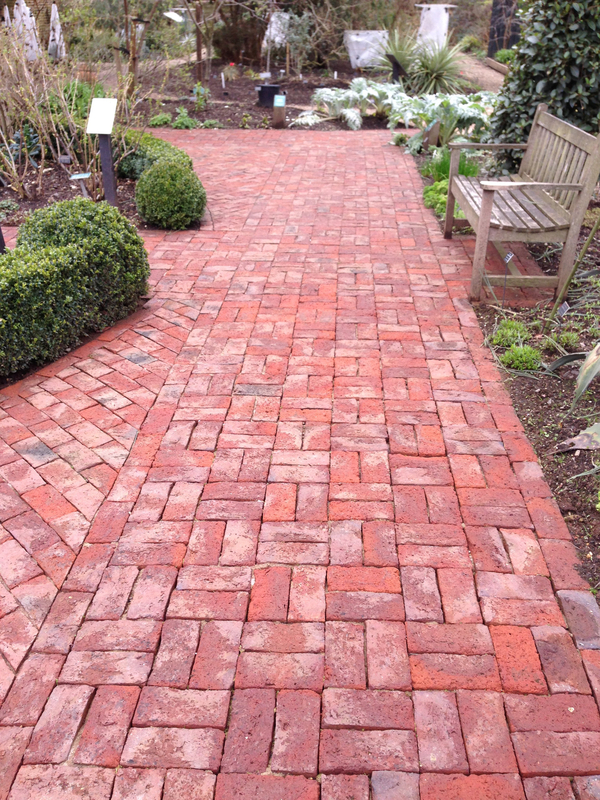 and here is the paving at Chelsea Physic Garden. The difference is water and scrubbing. There is no magic ingredient. They have keen young people to scrub and sweep and I’m exhausted just looking at it. Must try harder this year. Funny how you walk past something every day and then a friend in passing says “Oh dear, that looks a bit dead doesn’t it” and you realise it needs to go. We cut the trachelospermum right down and cleared out 20 years of dead stuff. 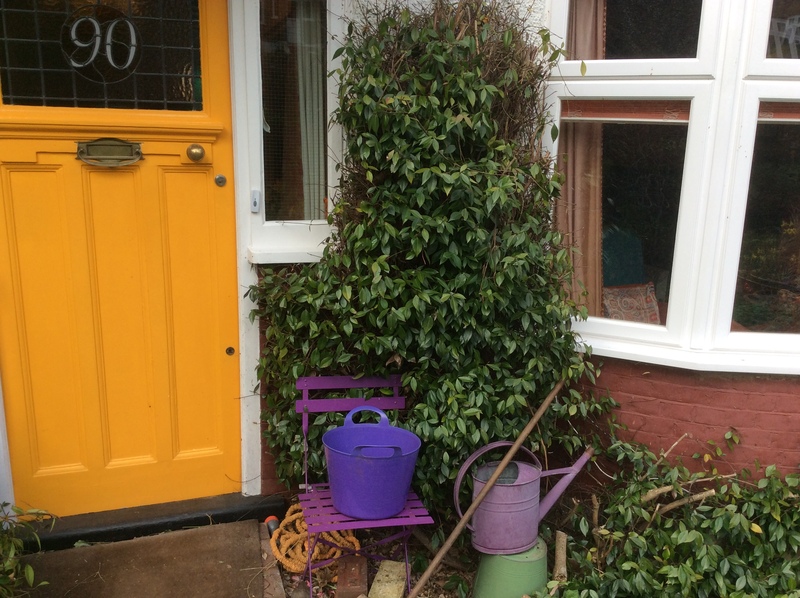 We put up a new trellis and the jasmine will now thrive with the the sun and light and might flower for once. We shall see. Two fantastic discoveries to save me lifting heavy bags of horticultural grit. 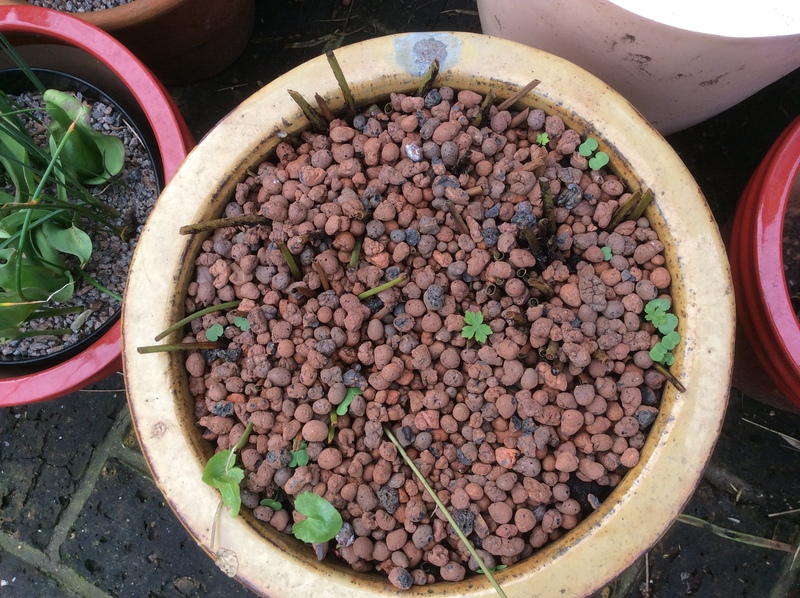 They are vermiculite for adding to compost and clay pebbles for a top layer in pots. Why didn’t I think of this before??? 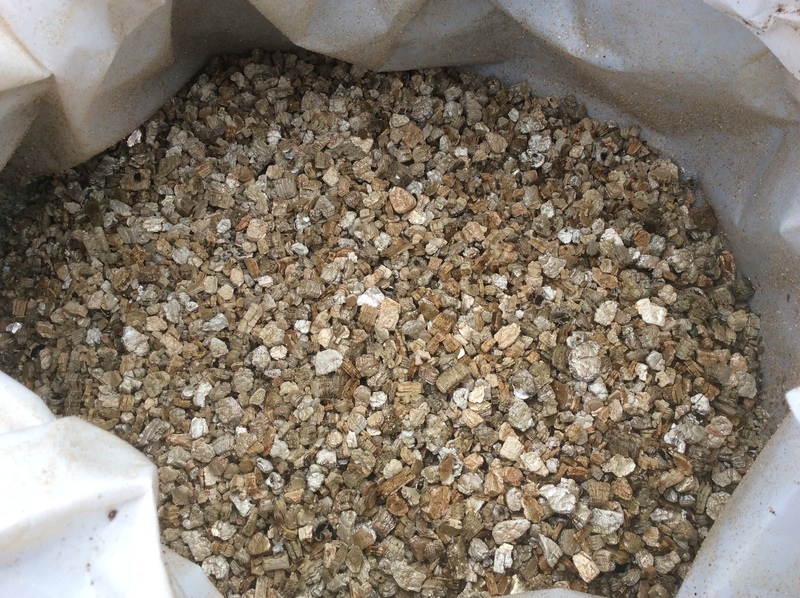 Vermiculite will help drainage in compost and is as light as a feather. Clay pebbles are lovely things. They look good as a top dressing, absorb water and a 100 litre bag is not too heavy to move. What can go wrong? I’ll let you know if and when. Thankyou again to the Propagator who hosts this theme of Six on Saturday . 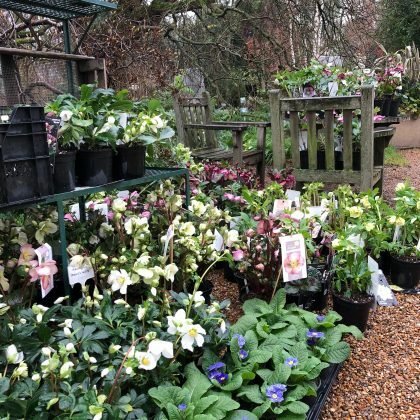 Over on his blog you can read what other gardeners have written. I hope everyone is enjoying the coming of Spring. 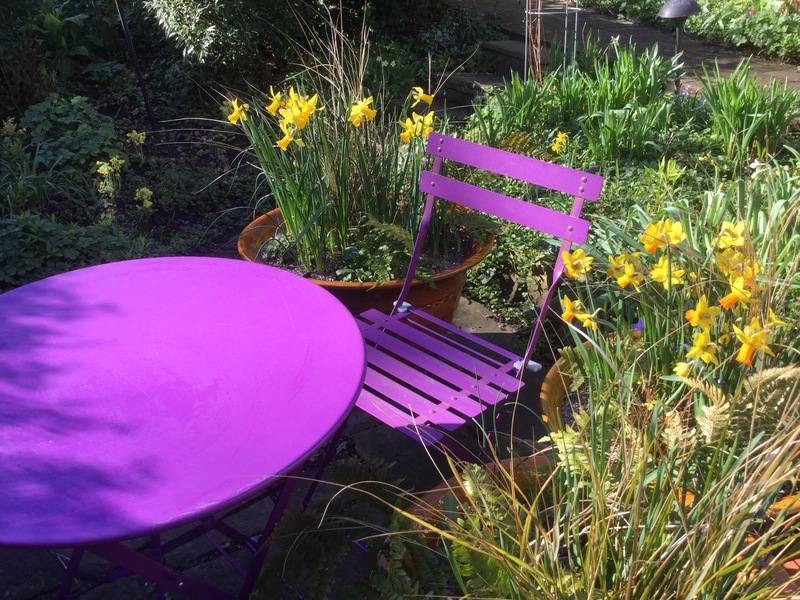 16 comments on "Six on Saturday 7th April 2018"
Oh I love your coloured patio table and chairs – ‘thinks’ I’ll paint mine too. 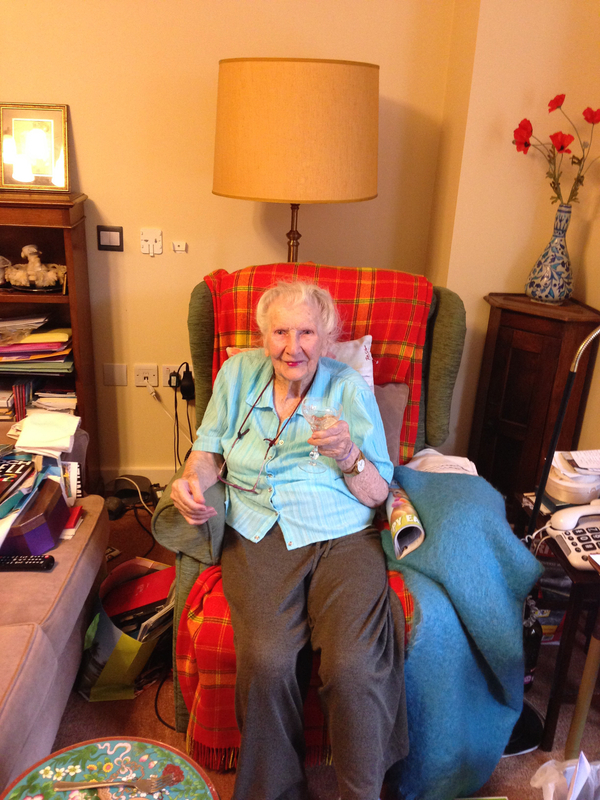 Your mum is wonderful, mine sadly died last year, she would have been 99 next week. Sorry to hear that Ronnie. Yes I am lucky there. The table and chairs came from Tesco I believe and do the job very well. I see you like colors, Julie! 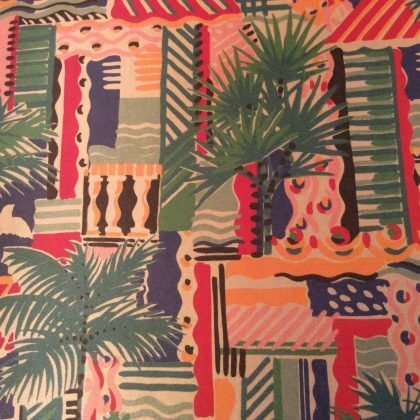 All these colors embellish your garden, it’s super pretty! I discovered last year vermiculite and I can’t live without it. Fred what do you use it for? I’m using it to half fill big pots to save on compost and keep them lighter plus I am mixing some in with the compost. Any other uses? Thankyou for liking the colours in the garden. Oh, thank you for the photo of your Mum. I hope that was a glass of wine she was holding. 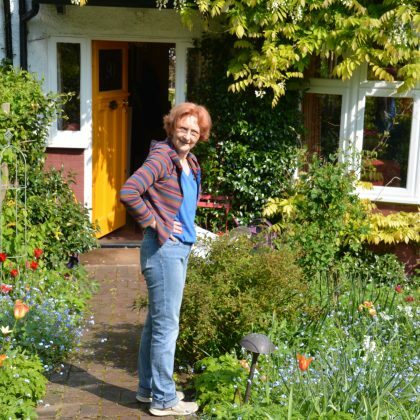 Over 100 and still gardening and drinking. My heroine. It was champagne ! thanks for your lovely comment Male. Yes I guess so, that gardening is all about hope for the future. thanks for your comment. 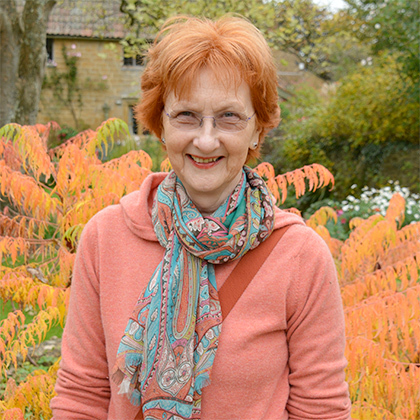 Thank you for sharing that story and photo of your mum. She’s a darling, and I very much want to be her when I grow up. 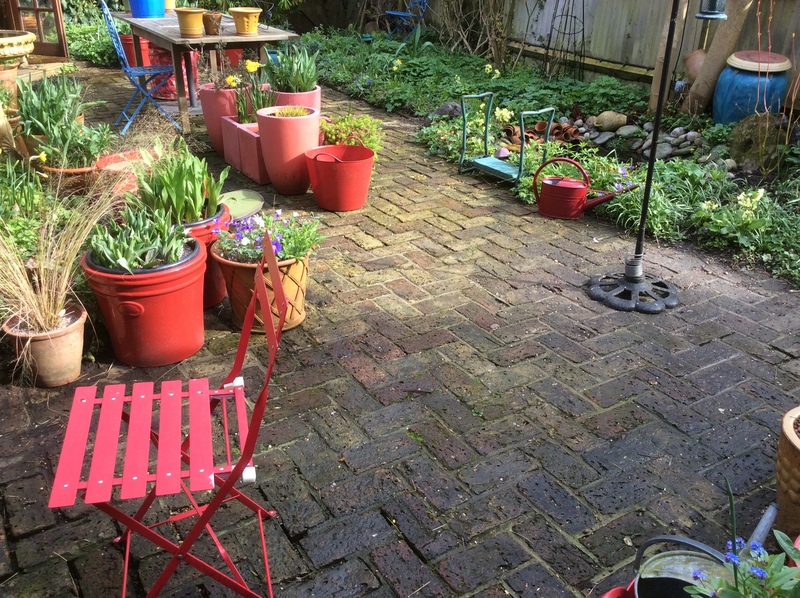 As for the brick paving, I really would not worry too much about that as long as it is not too slippery to walk on safely. Your paving hosts a multitude of mosses and microscopic plants..a fractal garden! Yes good point, in fact it has some lovely mosses and lichen on in which I am very careful not to dislodge. It does get very slippery but a bit of a scrub here and there should short that. thanks for your lovely comment. Your mum looks amazing, so sparky, and you’re very alike – in looks and preference! Well done for tackling the jasmine, they can get so out of control. 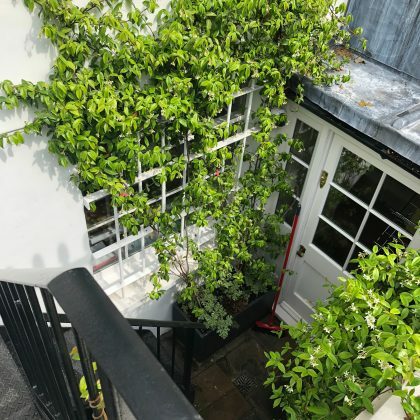 With roof works going on here at the flats, the builders have cut down a jasmine planted at least 10 years ago and never pruned – it had climbed to the fourth floor and was making its way over the roof! And it flowered every year. Astonishing. Like the others, I love the colour in your garden. Your mother is an inspiration. As to the bricks, does power washing damage them? Although, I agree w/Chicu that unless they’re slippery . 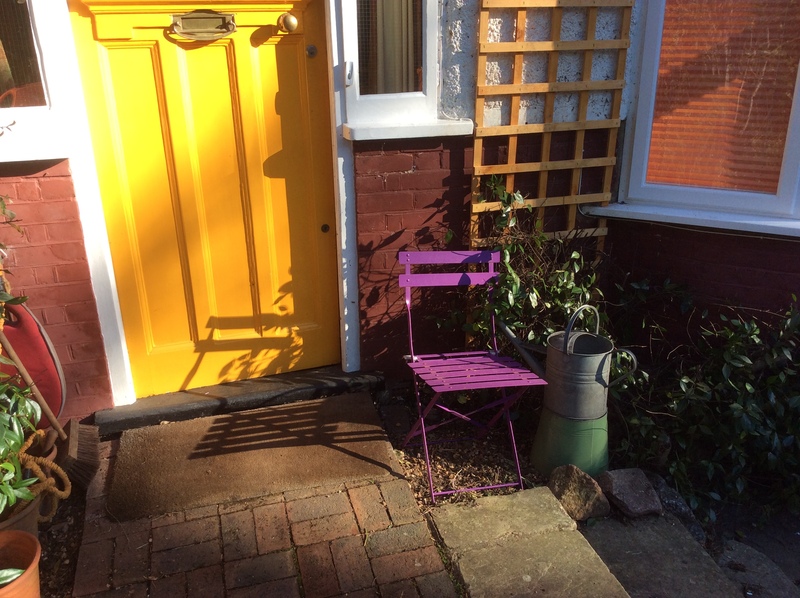 . . & that trod upon colour is much more pleasing than the brightly clean brick. Lovely six! Thankyou Lora, yes you are right, the paving looks fine nice and worn but in the winter it is a slippery as ice which is a problem but just have to deal with it. Yes, the washing does sometimes chip away a bit of brick as they are old and porous ones. I have to be careful. 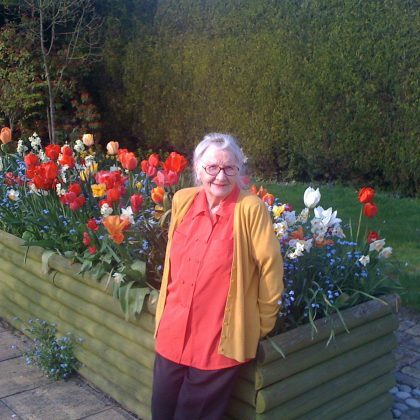 Your mum looks wonderful – and there is a lesson there about what is still important when you have reached a century: watching the bulbs you planted come up! Thanks for your friendly comment. Yes a good lesson for us gardeners.